Dicotyledons are a group of flowering plants that belong to the taxonomic class Magnoliopsida (formerly Dicotyledoneae). They are characterized primarily by the possession of two initial leaves, or cotyledons in the embryo, which is usually surrounded by the endosperm. For example, the bean is a dicot. 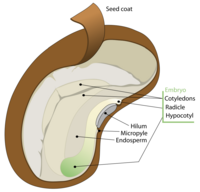 When a bean seed is opened, it can be separated into two halves that develop into the cotyledons. Dicot plants also generally have broad leaves with netlike veins. Dicotyledons' are a woody plant and the seed typically contains two embryonic leaves or cotyledons and is usually surrounded by the endosperm. Dicotyledons normally have wide leaves with netlike veins. The roots on them are most likely tap roots. During germination, the root of the radicle grows out to attach to the plant. Followed shortly after, a short stem above the root grows. 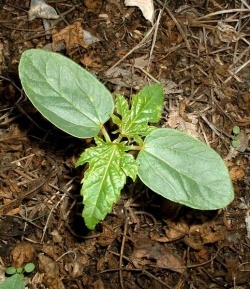 The hypocotyl then carries the cotyledons above the ground and they become the first sprouted green leaves on the plant. Then the stem, leaves, and branches are formed, while the development of the radicle forms the root-system. The growth rate and size of the adult plant varies. It can range from staying small and lasting only one season, to a forest tree that would easily live for centuries. Since these are mostly flowering plants they typically grow in gardens. They typically need calm weather environmets. They do vary in where they live and their sizes (their size affects the weather they can handle) but they usually don't live very long in harsh weather. They are usually found in gardens or in sunny environments. ↑ Magnoliopsida USDA, NRCS. The PLANTS Database. National Plant Data Team, Greensboro, NC 27401-4901 USA. 29 January 2013. This page was last modified on 18 May 2016, at 13:56.